In a study published this past January in Radiology, researchers cited data from the Centers for Disease Control and Prevention showing that the use of CT increased from 2.7 million scans performed nationwide in 1995 to 16.2 million in 2007. In a subsequent article published online in April, it was reported that, during approximately the same time period, CT procedures involving children increased from 330,000 to 1.65 million. It was also found that during this time, the use of imaging technology in emergency departments (EDs) increased an average of 16% annually. These data raise questions about unnecessary radiation exposure and increased cancer risk. However, among the four authorities interviewed for this article, there is little consensus on what, if anything, should be done differently when it comes to CT scans, especially in the ED. David B. Larson, MD, an assistant professor of radiology at Cincinnati Children’s Hospital Medical Center in Ohio, says fast, useful images are a major reason for CT’s growth. “One of the primary drivers is the improvement in the technology. 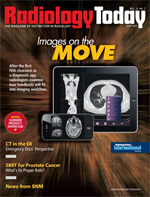 You get high resolution available very quickly,” says Larson, who was a coauthor of the articles in Radiology. He says other possible reasons are that ED personnel are seeing more serious cases than in the past. And notably, CT scans cost less but have a high margin of profitability. Perhaps the most compelling factor driving the increased use of CT is the pressure on emergency physicians to make quick, accurate diagnoses, according to the sources interviewed for this article. It does not appear that any particular disease or condition is causing the increase in CT scans. For instance, Larson says that over the past four years, CT scans for abdominal pain in children have increased 15% to 25%, but there has not been a rash of food poisonings or other factors leading to a corresponding increase in scans for stomach disorders. Frush acknowledges that the numbers showing a general increase in CT scans deserve attention. “And these numbers should make us more attentive to what we are doing to justify the examination so we only perform those which are clinically warranted,” he says. Frush adds that the exams should be individualized as much as possible, taking into consideration various factors such as age, gender, and the size of the area being imaged. But he also says the increased use of CTs has often been justified for its aid in correctly diagnosing, in a timely fashion, conditions such as appendicitis, spinal trauma, and blood clots in the lungs. At what point should people be concerned about radiation exposure from CT exams? Howard Blumstein, MD, FAAEM, president of the American Academy of Emergency Medicine and vice chair of emergency medicine at Wake Forest University in Winston-Salem, N.C., says there are two key areas of discussion when it comes to CT in the ED: the damaging effects of radiation and efforts to address that exposure. To address exposure concerns, Blumstein points to the joint project among the American Board of Medical Specialties, the American Board of Radiology, the ACR, and the American Medical Association to produce a guidance document on 15 or 16 measures to minimize the amount of radiation used in imaging. (A public comment period on the document concluded as this issue was in production.) Some of the measures, Blumstein continues, are not controversial, and he has no trouble accepting them. These include putting imaging studies into formats other practitioners can use, a hospital utilizing a CT scan it has already done on a patient instead of ordering another, and special protocols for children so they do not receive adult dosages. Instead, he has stronger criticism for the manner in which the Centers for Medicare & Medicaid Services (CMS) has recently commented that EDs have been ordering too many head CTs. “For the past several years, CMS has been correcting the data of individual hospitals,” says Blumstein. “CMS is attempting to improve monetary efficiency, so they’ve started posting their dry run data on their website. And, lo and behold, one of their recent issues has to do with the use of brain scans. CMS said that 35% of the scans for traumatic headache were inappropriate. This is even worse than the optimization project. Their calculations are totally unfair. I think they’re crazy. Utilizing imaging modalities that do not expose patients to ionizing radiation are one way to reduce exposure, but MRI and ultrasound are not always available or appropriate for the imaging need. Amis expresses empathy for the pressure ED doctors are under with the huge press of patients who need to be diagnosed quickly as well as the threats of fines and/or lawsuits for missing serious conditions, but he offers a different perspective. Nevertheless, Amis maintains there is enough information out there showing that, beyond conflicting reports, theory, and rough estimates, too many people are being subjected to too much radiation. Amis mentioned research showing that some patients in one study group received up to 132 CT scans, which he calls a “ridiculous” number. Moreover, Amis maintains that the analyses of the radiation fallout from Chernobyl and Japan are more specific to medical exams than rough extrapolations from nuclear explosions. “The measure of an absorbed dose that can be dangerous from any source is about 50 mSv,” Amis says. “The definitive study on this issue was in an article by Brenner and Hall published in The New England Journal of Medicine in 2007. They estimated that 1.5% to 2% of all cancers are due to CT scans alone, which came to 28,000 new cases of cancer every year. “I really strongly believe in the risks of excessive radiation,” Amis adds. “At our institution, we cut the number of CT exams by 5% last year. — Thomas G. Dolan is a freelance writer.